Of course the easiest explanation would be that cats hate water and think you are in danger, but the truth may be a little more complicated than that. The short truth is that nobody really knows why cats meow at you while you shower, but there are some probable reasons put forth by both professional and amateur researchers. Some people have theorized that cats meow at you when you shower because they think you are in some sort of danger. However, if this is true, it may not be due to the water involved because if they aren’t seeing the water (such as when you have closed the bathroom door), then how would they know about it? If the meowing is indeed a meow of caution or concern, then it could have nothing to do with water at all and more to do with their general behavior in regards to you, their owner. A concerned meow is usually due to what cats tend to perceive as danger, but after ruling water out, what are we left with? A number of other factors come to mind, especially their notorious separation anxiety. Many cats will follow you around the house, and if yours is one of them then think about the sudden shock of closing a door between you and them. Cats tend to meow on one side of a door because they hate to be trapped. Think of putting a cat in a bedroom, basement, bathroom, closet, etc, and remember the sound of their cries. Sounds a lot like the same type of meow you hear when you take a shower, doesn’t it? 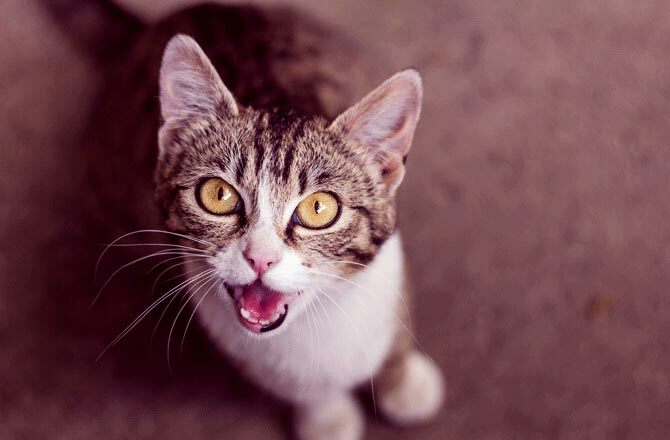 Cats can hear very high pitched sounds. That’s why they created cat whistles, to get a cat’s attention. So one theory that makes sense is that a shower tends to cause the pipes to make fairly high pitched noises consistently throughout the shower. If you heard an annoying high pitched sound for a long period of time, that might make you go crazy as well!